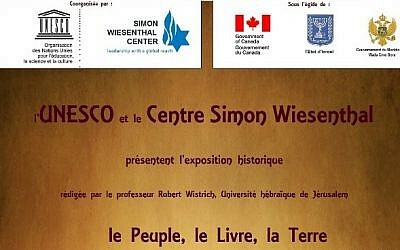 The exhibit, created by the Simon Wiesenthal Center, was co-sponsored by Israel, Canada, and Montenegro. SWC worked closely with UNESCO on the exhibit since 2011, when UNESCO accepted Palestine as a member state, the first UN body to do so. UNESCO Director-General Irina Bokova decided to cancel the event after Arab states in UNESCO protested, arguing it would harm the peace process. “We have a responsibility in ensuring that current efforts in this regard are not endangered,” Bokova wrote in a letter to the Wiesenthal Center. The event was scheduled to run from January 21 through January 30 at UNESCO’s Paris headquarters. It has been repeatedly delayed for the past two years, with organizers repeatedly bowing to UNESCO demands to make changes in the displays and literature at the event. The Wiesenthal Center is slated to hold a press conference on Monday to discuss the cancellation. Hier sent copies of his letter to US President Barack Obama, Prime Minister Benjamin Netanyahu, Canadian Prime Minister Stephen Harper and others. Nimrod Barkan, Israel’s ambassador to UNESCO, said that the excuse to shelve the event was “mean and stupid,” according to Israel Radio. 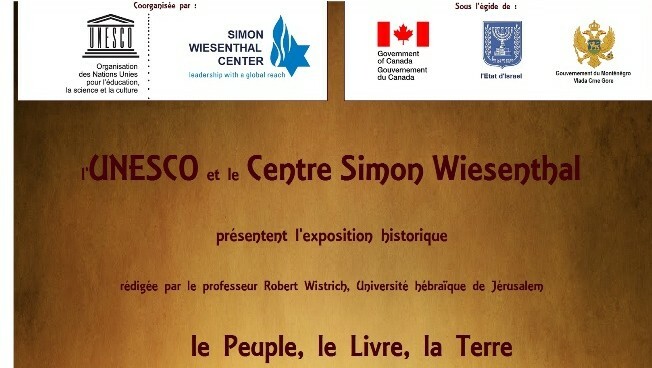 The invitation to the cancelled UNESCO event on 3,500 years of Jewish connection to the Land of Israel. “For all these reasons, for the major worry not to damage UNESCO in its… mission of support for peace, the Arab group within UNESCO is asking you to make the decision to cancel this exhibition,” he concluded, according to Algemeiner. 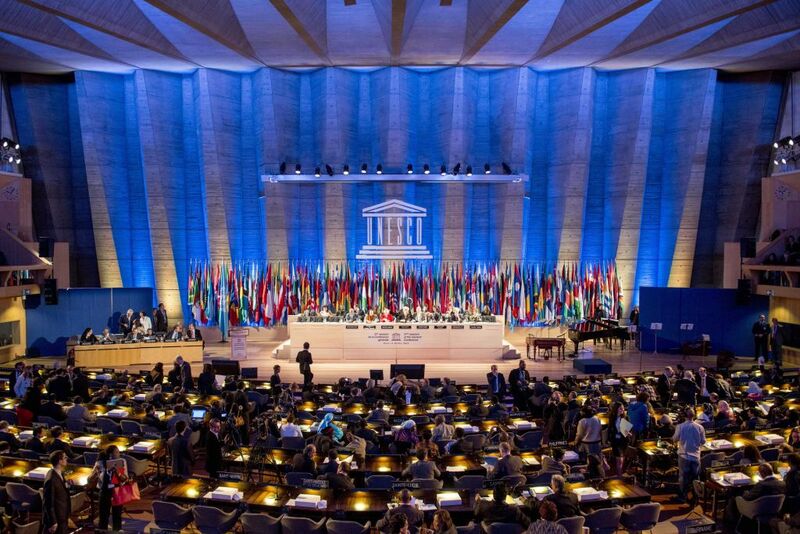 Some UNESCO decisions have long rankled Israel’s supporters. In 2012, UNESCO created a chair of Astronomy, Astrophysics and Space Sciences at the Islamic University of Gaza, which is closely linked with Hamas. 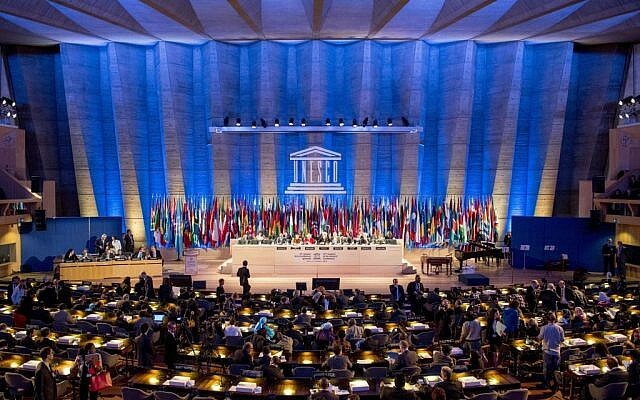 Last October, UNESCO voted in favor of no fewer than six resolutions condemning Israel at its 192nd Session of the 56-member Executive Board in Paris. The US and Israel both stopped paying dues to the organization after it allowed the Palestinians in, and both countries lost their voting rights in November 2013. The suspension of US contributions, which accounted for $80 million a year — 22 percent of UNESCO’s overall budget — brought the agency to the brink of a financial crisis and forced it to cut or scale back American-led initiatives such as Holocaust education and tsunami research over the past two years. UNESCO’s core mission, as conceived by the US, a co-founder of the agency in 1946, was to be an anti-extremist organization. Now, it seeks to tackle foreign policy issues such as access to clean water, teaches girls to read, works to eradicate poverty, promotes freedom of expression and works to give people skills to resist violent extremism.